Through the years, what you carry may change, but the need for a good-looking sturdy tote does not. This fabulous leather tote is built to last. 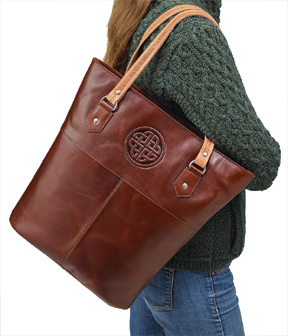 Slightly flared bag is embossed with a Celtic knot; the natural undyed leather handles are adorned with knotwork. Open top, cloth-lined, one interior zip pocket. Vegetable-tanned oiled leather builds a beautiful patina over time. 14 1/2" high x 15" wide at top. Handles are 25", with 9 1/4" drop. Handmade in Ireland. Shown in Brown, also available in Black.